Turkish Foreign Minister Mevlut Cavusoglu said Friday that U.S. President Donald Trump told his Turkish counterpart that the United States will no longer supply arms to Syrian Kurdish fighters. Cavusoglu said Trump relayed his decision during a telephone conversation with Turkish President Recep Erdogan. Cavusoglu said he was present in Erdogan’s office during the telephone call. Turkey considers the Kurdish Syrian fighters, the People’s Protection Units known by the initials YPG, to be terrorists because of their affiliation to outlawed Kurdish rebels that have waged a three decade-long insurgency in Turkey. The YPG was a key U.S. ally against the Islamic State group in Syria. “Mr. Trump clearly stated that he had given clear instructions and that the YPG won’t be given arms, and that this nonsense should have ended a long time ago,” Cavusoglu said in a press conference in the Turkish capital. There was no immediate reaction from the United States. But Turkey’s announcement appeared to catch the Pentagon and the U.S. State Department off guard. Officials at both agencies, who would normally be informed of changes in U.S. policy toward arming the Syrian Kurds, said they were unaware of any changes. The officials spoke on condition of anonymity. Relations between NATO allies Turkey and the United States have soured recently over a number of issues, including U.S. support to Syrian Kurdish fighters. “Of course, we were very happy with this,” Cavusoglu said. Although likely to upset the Kurds, it was unclear how much significance such a change would have on the ground. 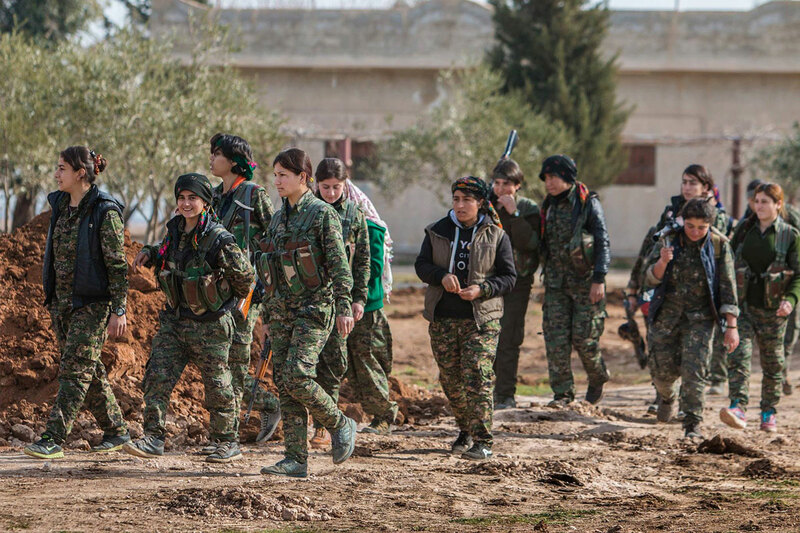 The United States has been arming the Kurds in their fight against the Islamic State group through an umbrella group known as the Syrian Democratic Forces, or SDF, which is comprised of Kurdish as well as Arab fighters. But the retreat of IS, which has lost nearly all its territory in Syria, has altered the dynamics in the region and a U.S. defense official said he was unaware of any additional arms scheduled to be transferred to the Kurds, even before the Turkish announcement. As the fight against IS has waned in recent months, the U.S. has pledged to carefully monitor the weapons it provides the Kurds, notably ensuring that they don’t wind up in the hands of Kurdish insurgents in Turkey known as the PKK. Both Turkey and the U.S. consider the PKK a terrorist group. But the United States has tried to draw a distinction between the PKK and the Syrian Kurds across the border, while Turkey insists they’re essentially the same. Still, Friday’s announcement from the Turkish foreign minister — if confirmed by the U.S. — would mark the latest blow to the Kurds. In both Syria and Iraq, the U.S. relied on battle-hardened Kurdish fighters to do much of the fighting against IS, but those efforts have yet to lead to a realization of the Kurds’ broader aspirations, most notably an independent state. Washington’s support for the Syrian Kurds, in particular, has been a major thorn in U.S.-Turkish relations for several years, given Turkey’s concerns about the Kurds’ territorial aspirations. In particular, Turkey has feared the establishment of a contiguous, Kurdish-held canton in northern Syria that runs along the Turkish border. Relations have has also been strained by Turkey’s crackdown on dissent following a failed coup attempt last year and Ankara’s demands that the U.S. extradite a Pennsylvania-based cleric that it blames for fomenting the coup. US to Stop Arming Syrian Kurdish Fighters. Turkey considers the Kurdish Syrian fighters to be terrorists. The US has been arming the Kurds to fight IS.